On the morning of Sunday 12th March 2017, the Church Choir of Saint Leonard’s Parish Church Loftus, processed in and out of church with the altar party for the very first time! Luke Bishop was formally appointed our Choir Crucifer and he ably led the processions into and out of church. 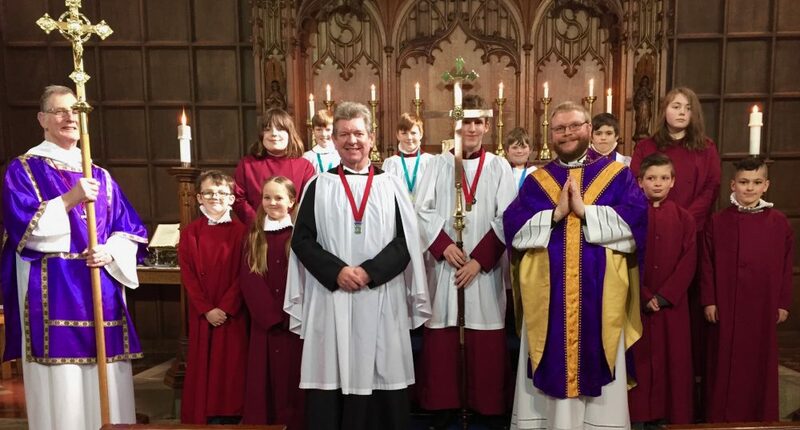 This photograph from after the Parish Mass (above) shows Luke Bishop (pictured centre) with The Rector, The Director of Music, John Dodd (our Altar-Party Crucifer) and with members of our growing Church Choir. Any young people aged seven to thirteen who may be interested in joining our excellent new choir should ask their parents / guardians to speak to our Director of Music, Mr Richard Bendelow on 01287 634429 Alternatively, please free free to attend one of our Sunday Morning Services at Saint Leonard’s Parish Church Loftus, which begins at 10:30am and make yourselves known to the Rector over coffee at the end of the service.